THPBlog: Humboldt Redwood Company to log in large tree stands NE of Grizzly Creek State Park. Humboldt Redwood Company to log in large tree stands NE of Grizzly Creek State Park. This THP is about a mile NE of Grizzly Creek State Park and Highway 36 near Maple Grove, CA. Humboldt Redwood Company is planning a tractor and cable logging operation in redwood, grand fir and Douglas fir forests at an elevation of 700 to 1,600 feet. The THP area drains into the Van Duzen River which is listed as an impaired watershed for sediment and temperature. There are 20 active to dormant landslide terrain sites in the THP area including earth flows, debris slides, rock slides and steep inner gorges. Logging inside large tree stands will occur along the SW corner of the THP area. 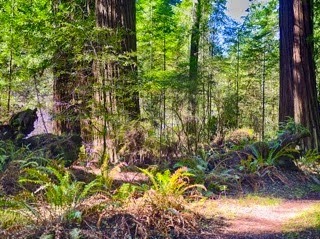 Humboldt Redwood Company plans to use ground based equipment in areas designated for cable logging to long line trees, swing yard and provide tail holds, and use heavy equipment for a skid trail re-opening through a class III (intermittent) watercourse. 17 road drainage sites are planned for work including rocking, ditch cleaning, dip construction and culvert repair/replacement. More information is available on the THP Tracking Center website.